Vail closes on Sunday with fresh snow forecast to fall weekend. Forecasters say Saturday is likely to be the best powder day, with 5 to 10 inches of new snow possible at Vail. The high end of that forecast would put Vail at 334 inches for the season, which is just a little below the seasonal average of 350. The settled base as of Friday was 60 inches, or five feet. Closing weekend at Vail will likely look a lot like this (Vail Resorts photo). Plentiful snow earlier in the season, primarily in December and January, contributed to a solid base that held up well through one of the driest Februaries on record. Then late March and early April saw a full-on return of winter, allowing Vail to extend its closing day from April 10 to April 17. And April continues to produce snow showers in the high country, with a major winter storm heading in Friday through Sunday. BROOMFIELD, Colo., April 14, 2016 /PRNewswire/ — Vail Resorts, Inc. (NYSE: MTN) today reported certain ski season metrics for the comparative periods from the beginning of the ski season through April 10, 2016, and for the prior year period through April 12, 2015. 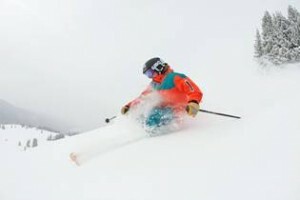 The reported ski season metrics are for the Company’s U.S. mountain resorts, excluding results from Perisher and the urban ski areas of Afton Alps, Mt. Brighton and Wilmot Mountain. The data mentioned in this release is interim period data and is subject to fiscal quarter end review and adjustments. Season-to-date total lift ticket revenue at the Company’s U.S. mountain resorts, including an allocated portion of season pass revenue for each applicable period, was up 19.3% compared to the prior year season-to-date period. Season-to-date ancillary spending increased compared to the prior year, with dining revenue up 16.0% and ski school revenue up 10.1% at the Company’s U.S. mountain resorts. Additionally, retail/rental revenue for U.S. resort store locations was up 11.5% compared to the prior year season-to-date period. Season-to-date total skier visits for the Company’s U.S. mountain resorts were up 13.4% compared to the prior year season-to-date period.